This easy all-in-one pork chop and rice casserole is super easy to fix, and it bakes to perfection in one dish. The pork chops are browned briefly and then the ingredients are combined in the baking dish. 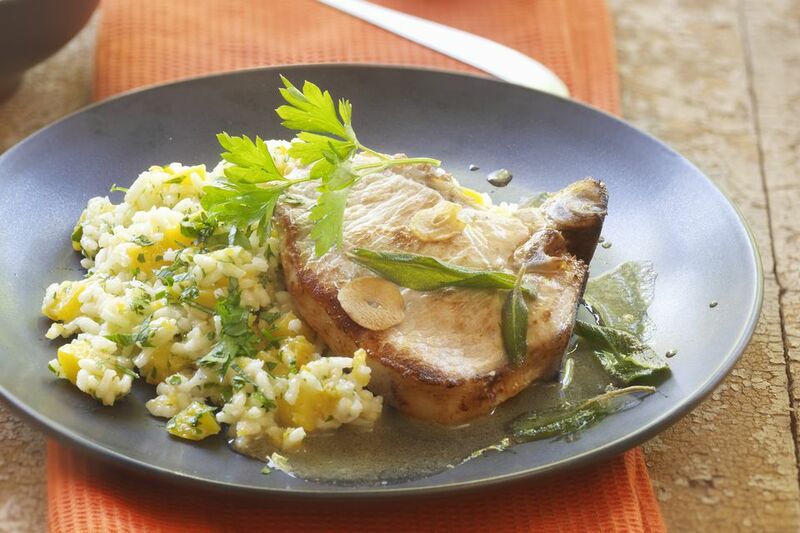 Boneless or bone-in pork chops may be used in this dish. Or make it with country-style ribs. Heat the olive oil in a heavy skillet over medium-high heat. Sear the pork chops, turning to brown both sides. Transfer the browned pork chops to a shallow baking dish; sprinkle with salt and pepper. Pour chicken broth over pork chops and then add the uncooked rice, green bell pepper, green onions, and diced tomatoes. Cover the baking dish with foil and bake in the preheated oven for 45 minutes to 1 hour, or until pork chops are tender and rice is done. Add about 1 cup of thawed frozen peas to the rice mixture. Uncover the baking dish and top the rice with 1/2 to 1 cup of cheese. Continue baking just until the cheese has melted.